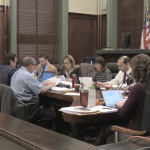 After a tense discussion that came with a lot of infighting, the Hoboken City Council voted to rescind the city’s parking changes they approved in November and tabled a preliminary budget that would’ve come with a two percent tax increase at Wednesday night’s meeting. “What we have here, ladies and gentlemen of this audience and this council, is a pure political move. 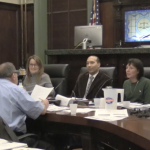 You have a councilman and a mayor that rushed into the budgeting process to plug a deficiency and now they’re cowering: it’s embarrassing, it’s embarrassing to watch,” 1st Ward Councilman Mike DeFusco exclaimed. DeFusco was on fire when addressing 3rd Ward Councilman Mike Russo’s new parking ordinance, which would’ve allowed residents to park at meters for free and decrease metered parking rates back down to $1 an hour for everyone else. 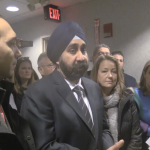 The measure was backed by Mayor Ravi Bhalla after business owners expressed dismay with what was billed as “dynamic parking changes” that went into effect last month. 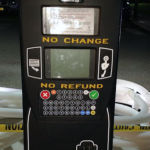 However, DeFusco and other members of the council argued that the $112 million city spending plan, which would come with a 2.5 percent tax increase, was filled with “gimmicks” from the administration – particularly regarding the parking utility. Although his local legislation was not popular among his colleagues, Russo was happy to stand and trade with DeFusco, particularly over accusing him of doing the mayor’s bidding. “You want to talk about carrying water – first of all, I don’t carry anyone’s water but the residents of this city. That’s number one,”Russo shot back. Number two, every single on this council has carried the water for a mayor … you want to talk about politics? You all play that game. Who you kidding?,” noting that Councilwoman-at-Large Vanessa Falco is the only person who hasn’t carried water for a mayor. Despite more criticisms, Russo insisted repeatedly that his measure be voted on rather than tabled, even after a last ditch effort to reach a compromise by 5th Ward Councilman Peter Cunningham. “Let do 15 minutes of free parking for the residents. It’s not going completely backwards, it’s a negotiation,” he began before Russo cut in. At that point, Cunningham made a motion to table the ordinance, which was seconded by Council President Jen Giattino. The measure passed 6-3, with Russo, 4th Ward Councilman Ruben Ramos and Councilman-at-Large James Doyle voting no. Needless to say, Russo was less than pleased that things took the turn they did, taking out some of his frustrations on Giattino. “When someone doesn’t agree with you, you try to just bully them into your way of thinking,” he said. “Councilman Russo, there’s really only one bully at this table. And when you look in the mirror, that’s him,” she responded. 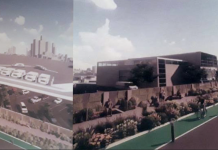 More theatrics were on the way after a measure to repeal the parking changes that were approved in November, introduced by 2nd Ward Councilwoman Tiffanie Fisher and Giattino. That measure passed 5-3(1), with Doyle, Falco and Russo voting no and Councilwoman-at-Large Emily Jabbour abstaining. 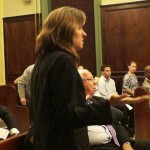 Fisher then pleaded her case that the current budget needed a lot of fine tuning before it received consideration from the council, inevitably leading to a showdown with Russo. “The administration put out effectively two inconsistent policy initiatives that were completely intertwined. One was a budget that significantly relied on significant increases in parking revenues and then put out something,” she began before Russo jumped in. 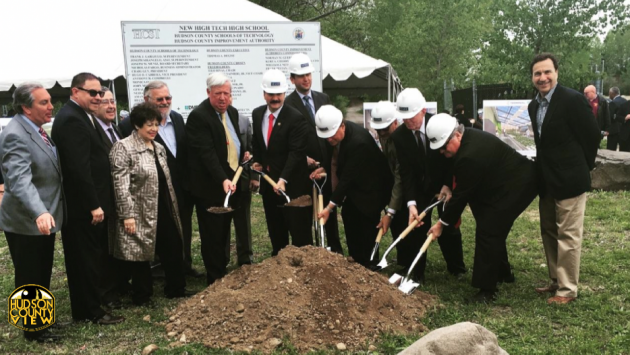 “Out of $120 million dollars we’re doing $600,000,” the councilman said. “It’s not $600,000, it’s not $600,000,” Fisher responded. “I’m sorry, that’s what I heard,” Russo said with a look of utter disbelief on his face. “Yeah, because they can’t budget for it, they can’t budget for it. They’re only allowed to budget for what they already started to incur last year,” she explained. “We’re talking about the budget though, right?,” Russo said sarcastically. Fisher continued that the budget, in it’s current form, took $3 million out of the surplus with the hope that it would be replenished by parking utility revenue. “I don’t think that was the conversation: I’ve got to be honest with you councilwoman. I think we made a decision to take $3 million dollars. I don’t think there was any predication on what we were anticipating: we might have been hopeful,” Russo rationalized. “No, they’ve been anticipating that,” Giattino quipped back. Ultimately, the first reading of the budget was tabled and will likely not be revisited by the council until next month. City spokesman Vijay Chaudhuri said the council majority’s actions showed a clear “continued political vendetta” against Bhalla and took aim at Fisher in particular. 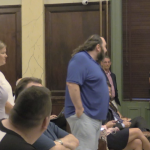 “Anyone who watched the Council meeting on Wednesday saw how the Council, led by Tiffanie Fisher, embarrassed themselves as they continued to electioneer on the Council dais with half truths and inappropriate attacks on the Mayor and his hardworking staff,” he said. “Ahh Vijay… I disagree that anti-business measures and an underfunded budget are prudent policies. As I said last night, I want to work with the administration to obtain the best outcome for parking and the budget for all our residents and the business community,” Fisher responded. Typical DeFusco hypocritical hysterics and political theater from the bombastic marketing slickster turned politician with aspirations of advancing his political career to possibly become mayor. 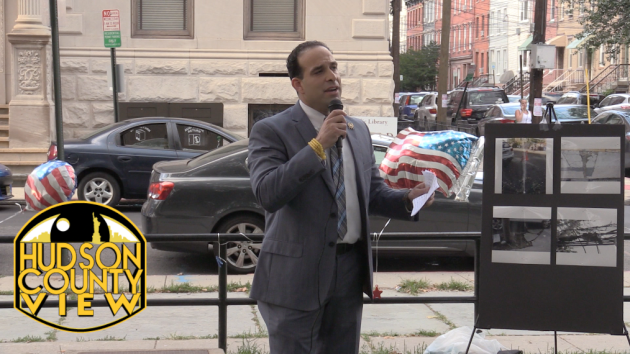 After all his inflammatory rhetoric has died down, DeFusco can not truthfully be given credit for doing anything positive for those who live in the First Ward or even Hoboken as a whole. Why the Council drama for the TV cameras ? Fear. Councilman Russo again goes into the November elections as near invincible. He also has tremendous influence that if he chose to use it can flip the elections in the DeFusco’s First Ward and Gianttino’s Sixth Wards and to a lesser degree Fisher’s Second Ward and Cunningham’s Fifth Wards. Lets go to the Video Tape! Sounds like you’re a russo fan. I bet this just started because he votes with Ravi. Hypocrite. Also not sure why this site is going to start using graphics from someone the mayor paid as part of his campaign. This one is pretty even handed but it seems like a bad idea to do that from any side. 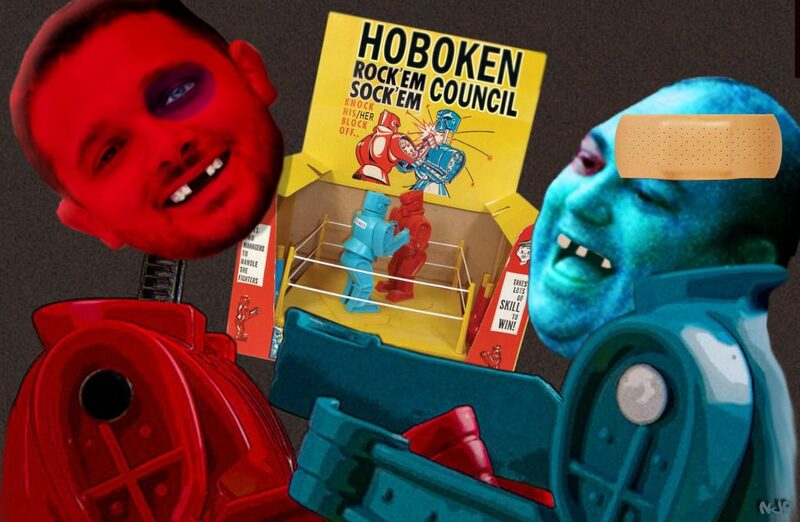 Russo stuffed his face while attempting to stuff overdevelopment into Hoboken – $stuffing his coffers. He learned from the Bonnie and Clyde of Hoboken. Russo hasn’t won a competitive election since before his father was sent to prison, he should be the one worried. Sad that Ravi once stood for good government but is now willing to snuggle up to a guy who mistakenly had lunch with the FBI. I’d rather be the council people who “carried water for Zimmer” than Russo and his cuzin’ Terry who carried water for his convicted felon father and carried quarters ( so to speak) for convicted felon John Corea. Russo is a joke, his inner Al Capone always shines through when he has nothing left.